David Norris's volley in extra time prevented Crewe causing an upset and put Championship side Ipswich through to the third round of the Carling Cup. League Two Crewe had the better chances to win the game as Clayton Donaldson narrowly failed to reach Joel Grant's cross from seven yards out. Ipswich goalkeeper Brian Murphy saved from Shaun Miller and Byron Moore. But when Crewe failed to clear a corner, Norris fired in a volley to give the visitors victory. "We sent our fans home happy and that's not always been the case recently when we lose at home. "The players put in good performance against a much bigger club and I think we may have had the best chances of the match. "I would have been happy for it to go to penalties as I quite fancied us in that. But in the end a wonder strike beat us." "We never got going in the first half but credit to Crewe they made life difficult for us. "We just want a home draw because it's been tough for us with extra time again. "As everyone knows in the Cup it's just about getting into the next round." 122:31 The game gets underway. 120:00+0:04 Attacking throw-in by Shane O'Connor (Ipswich). 120:00 The referee signals the end of extra time. 119:03 David Artell gives away a free kick for an unfair challenge on Gareth McAuley. Direct free kick taken by Brian Murphy. 118:16 Jason Scotland concedes a free kick for a foul on Luke Murphy. Ashley Westwood takes the free kick. 117:57 Corner taken by Ashley Westwood from the left by-line, Gareth McAuley manages to make a clearance. 116:01 Booking Clayton Donaldson (Crewe) booked for unsporting behaviour. 115:07 Brian Murphy takes the free kick. 115:07 Booking The referee shows Luke Murphy a yellow card for unsporting behaviour. 115:01 Clayton Donaldson challenges Shane O'Connor unfairly and gives away a free kick. 114:25 Defending throw-in by Shane O'Connor (Ipswich). 110:03 Tamas Priskin has a shot on goal from outside the area which misses right. 109:43 Luke Murphy takes a shot. Brian Murphy makes a save. 109:14 Corner from right by-line taken by Ashley Westwood. 108:32 Foul by Jaime Peters on Clayton Donaldson, free kick awarded. Free kick taken by Lee Bell. 108:10 Attacking throw-in by Shane O'Connor (Ipswich). 107:35 Free kick awarded for a foul by Grant Leadbitter on Ashley Westwood. Rhys Taylor takes the direct free kick. 107:02 Attacking throw-in by Shane O'Connor (Ipswich). 106:56 Attacking throw-in by Shane O'Connor (Ipswich). 105:37 Attacking throw-in by Byron Moore (Crewe). 105:00+0:59 Goal kick taken long by Rhys Taylor (Crewe). 105:00+0:46 David Norris produces a left-footed shot from deep inside the area which goes wide of the left-hand post. 104:19 Defending throw-in by Danny Blanchett (Crewe). 102:13 Substitution Joel Grant goes off and Danny Shelley comes on. 100:58 GOAL - David Norris:Crewe 0 - 1 Ipswich A goal is scored by David Norris from inside the penalty area to the top right corner of the goal. 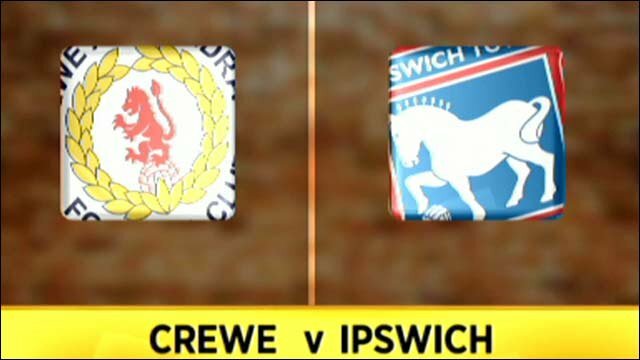 Crewe 0-1 Ipswich. 99:54 Grant Leadbitter takes a outswinging corner. 99:21 David Norris takes a shot. Patrick Ada gets a block in. 98:45 Unfair challenge on Lee Bell by Ronan Murray results in a free kick. Patrick Ada takes the direct free kick. 96:32 The referee blows for offside. Direct free kick taken by Rhys Taylor. 96:12 Byron Moore takes a shot. Save made by Brian Murphy. 95:50 Effort from deep inside the area by Tamas Priskin misses to the right of the target. 93:59 Gareth McAuley takes a shot. Save by Rhys Taylor. 93:18 Free kick awarded for an unfair challenge on Jason Scotland by Lee Bell. Direct free kick taken by Grant Leadbitter. 92:28 Corner taken right-footed by Ashley Westwood, clearance by Gareth McAuley. 91:52 Volleyed left-footed shot by Byron Moore. Brian Murphy makes a fantastic save. 91:29 Substitution Byron Moore on for Shaun Miller. 90:16 Attacking throw-in by Lee Bell (Crewe). 90:00+3:05 Shaun Miller takes a shot. Brian Murphy makes a save. 90:00+2:27 Defending throw-in by Lee Bell (Crewe). 90:00+1:50 Attacking throw-in by Danny Blanchett (Crewe). 90:00+1:44 Defending throw-in by Troy Brown (Ipswich). 90:00+0:31 Attacking throw-in by Danny Blanchett (Crewe). 90:00 Normal time is of over and the game goes into extra time. 89:15 Headed effort from inside the area by Clayton Donaldson misses to the left of the goal. 87:17 Defending throw-in by Danny Blanchett (Crewe). 85:15 Goal kick taken long by Rhys Taylor (Crewe). 84:38 Attacking throw-in by Troy Brown (Ipswich). 83:25 Goal kick taken short by Brian Murphy (Ipswich). 83:07 Effort from deep inside the area by Shaun Miller misses to the left of the target. 82:31 Ronan Murray takes a shot from long distance which goes wide of the right-hand upright. 79:52 Attacking throw-in by Danny Blanchett (Crewe). 77:44 Free kick taken by Patrick Ada. 77:44 Booking Shane O'Connor booked. 77:14 Clayton Donaldson fouled by Shane O'Connor, the ref awards a free kick. 76:53 Shot from outside the box by Tamas Priskin misses to the left of the goal. 76:46 Defending throw-in by Shane O'Connor (Ipswich). 75:55 David Norris takes a shot. Save by Rhys Taylor. 74:39 Attacking throw-in by Danny Blanchett (Crewe). 73:37 Goal kick taken long by Brian Murphy (Ipswich). 73:05 Joel Grant has an effort at goal from deep inside the area missing to the right of the target. 72:45 Unfair challenge on Lee Bell by Ronan Murray results in a free kick. Lee Bell takes the direct free kick. 72:26 Attacking throw-in by Danny Blanchett (Crewe). 71:04 Attacking throw-in by Troy Brown (Ipswich). 69:36 David Artell takes the direct free kick. 69:36 Booking The referee shows Tommy Smith a yellow card. 69:22 Free kick awarded for a foul by Tommy Smith on Clayton Donaldson. 68:41 Effort on goal by Tamas Priskin from long range goes over the crossbar. 68:12 Attacking throw-in by Shaun Miller (Crewe). 67:03 Attacking throw-in by Shane O'Connor (Ipswich). 66:22 Attacking throw-in by Danny Blanchett (Crewe). 65:50 Attacking throw-in by Shane O'Connor (Ipswich). 65:04 Joel Grant has an effort at goal from deep inside the area missing to the right of the goal. 64:24 Ashley Westwood restarts play with the free kick. 64:24 Booking David Norris goes into the book for unsporting behaviour. 63:55 Foul by David Norris on Clayton Donaldson, free kick awarded. 62:46 Goal kick taken long by Brian Murphy (Ipswich). 62:28 Shot from outside the box by Luke Murphy misses to the left of the goal. 62:19 Defending throw-in by Tamas Priskin (Ipswich). 60:52 Ronan Murray challenges Danny Blanchett unfairly and gives away a free kick. Free kick taken by Danny Blanchett. 59:24 Substitution (Ipswich) makes a substitution, with Ronan Murray coming on for Carlos Edwards. 59:24 Substitution Jaime Peters joins the action as a substitute, replacing Darren O'Dea. 58:42 Ashley Westwood takes a inswinging corner. 57:06 The referee blows for offside against Clayton Donaldson. Shot on goal comes in from David Norris from the free kick, Rhys Taylor makes a save. 55:25 David Norris has an effort at goal from just outside the box which goes wide of the right-hand upright. 54:10 Attacking throw-in by Carlos Edwards (Ipswich). 53:28 Attacking throw-in by Carlos Edwards (Ipswich). 51:01 Free kick awarded for a foul by Lee Bell on Tamas Priskin. David Norris has an effort direct from the free kick, Rhys Taylor makes a save. 49:14 Jason Scotland takes a shot. Blocked by Patrick Ada. 48:46 Tamas Priskin fouled by Lee Bell, the ref awards a free kick. Brian Murphy takes the direct free kick. 48:14 Attacking throw-in by David Artell (Crewe). 47:34 Goal kick taken long by Rhys Taylor (Crewe). 46:46 Corner taken right-footed by Grant Leadbitter. 46:20 Attacking throw-in by Troy Brown (Ipswich). 45:31 Substitution Jason Scotland replaces Luke Hyam. 45:00+1:26 Shaun Miller is penalised for handball and concedes a free kick. Brian Murphy restarts play with the free kick. 45:00 The first half comes to an end. 44:33 Defending throw-in by Troy Brown (Ipswich). 41:45 Substitution (Crewe) makes a substitution, with Jordan Connerton coming on for Matt Tootle. 39:35 Danny Blanchett produces a right-footed shot from just outside the box that misses to the right of the goal. 39:13 Outswinging corner taken right-footed by Ashley Westwood from the right by-line. 38:43 Ashley Westwood takes a shot. Blocked by Gareth McAuley. 38:30 Attacking throw-in by Shaun Miller (Crewe). 36:33 Carlos Edwards takes a shot. 35:45 Unfair challenge on Clayton Donaldson by Darren O'Dea results in a free kick. Ashley Westwood takes the free kick. 31:42 Defending throw-in by Matt Tootle (Crewe). 30:44 Gareth McAuley gives away a free kick for an unfair challenge on Clayton Donaldson. Lee Bell takes the free kick. 29:28 Defending throw-in by Darren O'Dea (Ipswich). 28:35 Goal kick taken long by Rhys Taylor (Crewe). 28:23 Shane O'Connor produces a left-footed shot from deep inside the penalty area which goes wide of the left-hand post. 26:32 Tamas Priskin gives away a free kick for an unfair challenge on Joel Grant. Rhys Taylor restarts play with the free kick. 26:27 Goal kick taken long by Rhys Taylor (Crewe). 25:55 Booking Grant Leadbitter is shown a yellow card for unsporting behaviour. 24:07 Luke Hyam takes a shot. Save by Rhys Taylor. 23:21 Patrick Ada challenges Gareth McAuley unfairly and gives away a free kick. Brian Murphy takes the direct free kick. 22:24 Inswinging corner taken from the right by-line by Shane O'Connor, save by Rhys Taylor. 21:09 Defending throw-in by Danny Blanchett (Crewe). Correction - 20:00 Inswinging corner taken right-footed by Grant Leadbitter from the right by-line, save by Rhys Taylor. 20:00 Inswinging corner from right by-line taken right-footed by Grant Leadbitter (Ipswich) to centre, save (caught) by Rhys Taylor (Crewe). 19:12 Defending throw-in by Troy Brown (Ipswich). 17:53 Attacking throw-in by Matt Tootle (Crewe). 13:58 Shot from outside the box by David Norris goes wide right of the target. 13:48 Defending throw-in by Matt Tootle (Crewe). 11:55 Attacking throw-in by Troy Brown (Ipswich). 11:17 Patrick Ada takes has a header from just inside the penalty box which clears the crossbar. 10:53 Goal kick taken long by Brian Murphy (Ipswich). 10:41 Joel Grant delivers the ball. 9:12 Outswinging corner taken right-footed by Ashley Westwood from the right by-line, Tommy Smith manages to make a clearance. 7:50 Inswinging corner taken from the left by-line by Ashley Westwood, Clayton Donaldson concedes a free kick for a foul on Brian Murphy. Brian Murphy takes the free kick. 7:27 The ball is delivered by Tamas Priskin. 5:33 Attacking throw-in by Danny Blanchett (Crewe). 4:43 Attacking throw-in by Danny Blanchett (Crewe). 4:16 Attacking throw-in by Lee Bell (Crewe). 3:03 Defending throw-in by Danny Blanchett (Crewe). 2:10 Goal kick taken long by Rhys Taylor (Crewe). 1:37 Attacking throw-in by Darren O'Dea (Ipswich). 0:28 Attacking throw-in by Tamas Priskin (Ipswich).